The treatment is recommended especially for pregnant women (after the first trimester). The treatment can be continued after childbirth (also during breastfeeding). If there is a tendency to stretch marks, we recommend using the treatment twice a month. 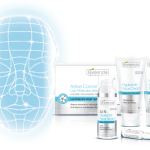 Prevention and wellness – once a month in combination with body and face care. Apply the right amount of the Mineral Body Scrub to clean skin of the selected parts of the body (remember to stir the product before use). Gently scrub the body using moist hands. Then, put a towel soaked in lukewarm water on the scrubbed body part and leave it for a few minutes to dissolve the minerals. Next, remove the scrub using compresses or in the shower. Apply a dose of the Strengthening Serum for Thighs, Belly and Breasts onto your hands, spread and gently massage it into the body parts subject to the procedure until fully absorbed. Do not rinse off. Mix 2.5 scoops of the Soothing Algae Mask for Belly and Breasts with 3 scoops of warm mineral water (or a multiple of this amount, depending on the surface of the body subject to the procedure) to obtain a uniform paste. Apply the mask evenly to the body parts subject to the procedure. Remove after 15 minutes. Apply a dose of the Natural Firming Oil onto your hands. Apply the oil to selected parts of the body and perform a gentle massage. Leave to absorb, do not wash off.